Map outlines are cool. People make art out of them, and sometimes even put it on their body. 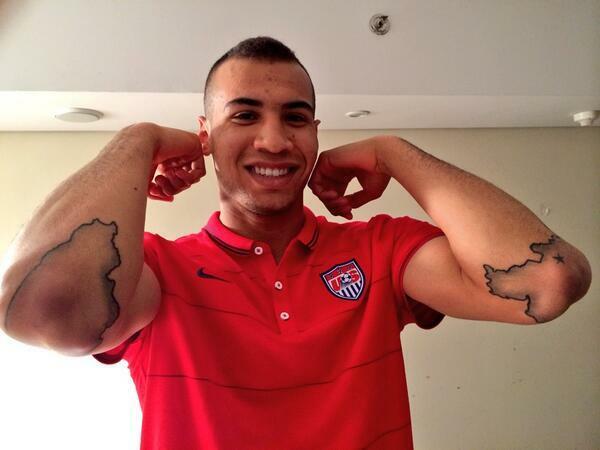 Monday’s USMNT win against Ghana in the FIFA World Cup brought John Brooks Jr. to the spotlight. A German-born American defender who scored the winning goal in the 86th minute. He also has some really cool tattoos that represent his heritage. One is a map of Germany, the other a map of Illinois. We were super excited about yesterday’s game, and when we learned about Mr. Brooks’ tattoos, it reminded us of all the cool things you can do with map outlines in Salesforce using Geopointe, and of course, we wanted to share. A lesser known feature of Geopointe is Demographic Overlays. Apply US Census data to your maps and view metrics like household income, age, race, or marital status distributions inline with your Salesforce data. You can choose to show map outlines at the State, County, Tract or Block Group levels. By drawing and saving these shapes, you are creating your own powerful, custom overlays. Use these borders to filter and take actions against your data like Add to Campaign or Change Owner. After drawing these shapes, make sure you save them, so you can re-use them on your map whenever you need to. Just pretend you are a tattoo artist…that will make drawing your sales territories a lot more fun. Have you tried these Geopointe features yet? What other kinds of things would you like to do with map outlines in Geopointe? Let us know on our ideas site.